The Armada RAM cooler is yet another sleek product from VIZO Technology Corp. The packaging was well-designed and the product itself of impeccable built. They may be an unknown company today but if they continue producing good products, who knows how far they can go? Although it's really a simple design with three 40 mm fans arranged in parallel, the Armada did its job well enough. In our tests, it successfully reduced the temperature of the first memory module by 8.7 °C while cooling the second module by 5.8 °C. That may not sound like much but it is a significant improvement in the cooling of the memory modules because it actually kept the first module just 5.9 °C above ambient temperature. Now, that's impressive. Even the second module was kept a cool 7.5 °C above ambient temperature. For those who are interested in case modding, you might be interested in the fact that the Armada glows in a very bright blue light while it's running. That might be a worthy consolation for the fact that installing the Armada will block out any view of your memory modules, especially they too have bling bling features like LED lights or special heatspreaders. 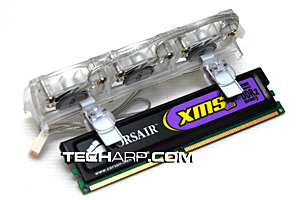 Do note that this RAM cooler appears to be designed for plain jane memory modules. In other words, memory modules that do not have heatspreaders. If you are using memory modules with heatspreaders, you can still fit the Armada, just not as securely as you would with an ordinary memory module. In addition, the Armada's 40 mm fans use sleeve bearings. While they did not seem to be extraordinarily loud to us, we wished VIZO could have spent a little money on ball bearings instead. Ball bearings are quieter, more reliable, work better in the vertical orientation. Overall, the VIZO Armada is a well-designed and well-built product. If you are looking for an active cooling solution that works as advertised, and looks good to boot; you should certainly consider the VIZO Armada.